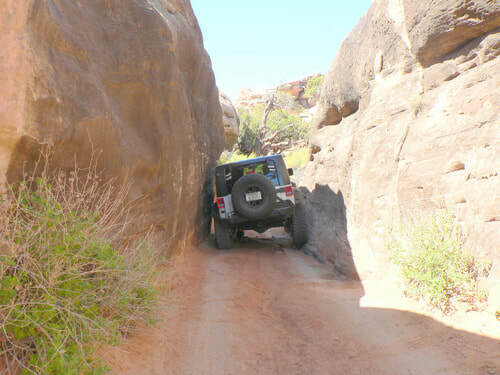 Elephant Hill is a Jeep trail that combines great Jeeping and great scenery. 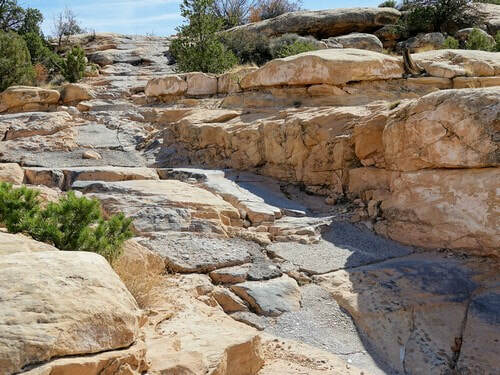 The trail itself is not all that long, but it can take a long time to get there. 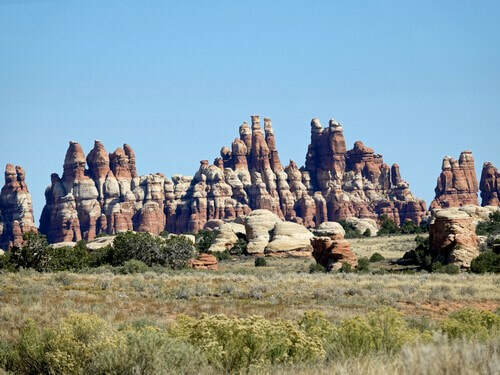 It is in the Needles District of Canyonlands National Park. 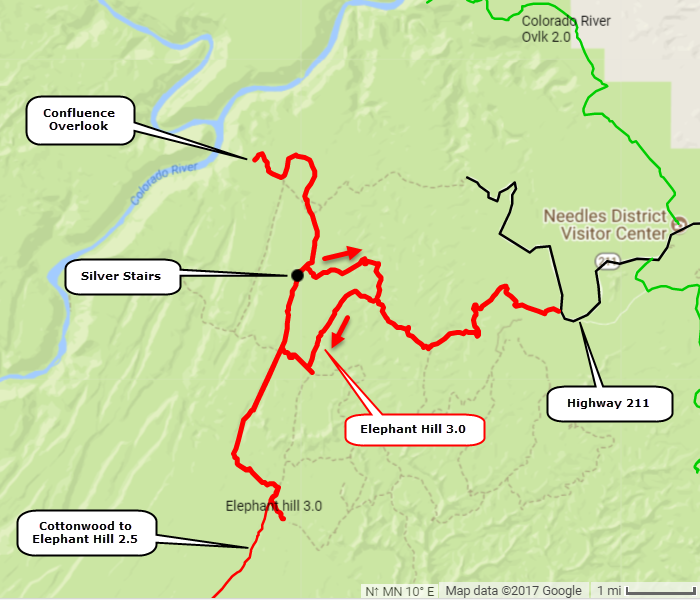 Most people start Elephant Hill from Highway 211 inside the Park and exit the same way. Another option is to enter or exit from the south via Cottonwood Bridger Road GP. See Cottonwood to Elephant Hill 2.5. Elephant Hill trail as described here goes south far enough to access the Joint Trail hike. 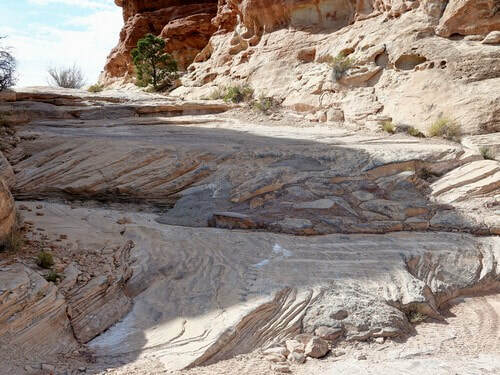 You can simply go a bit farther south on Cottonwood to Elephant Hill 2.5 to see needles, then head back to 211 if that is the way you want to go out. 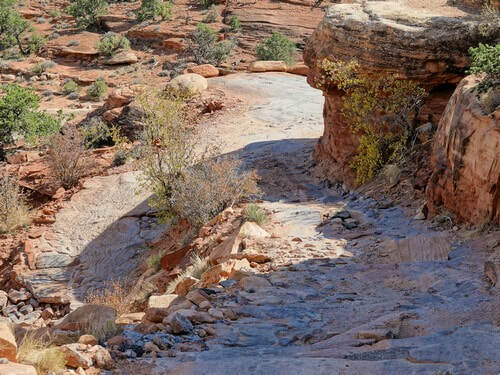 The photo above show a switchback on the east side of Elephant Hill. This is the first obstacle you encounter, but it is not the worst. Come uphill from the left side of the photo and drive out on the wide point to turn around and continue up the hill. ​Go along the top of the ridge and then descend the west side. 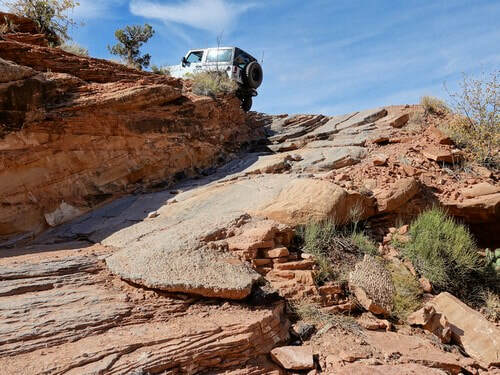 There are more obstacles as you continue down. You soon come to a one-way loop where you must take the left fork. There is an interesting squeeze along the south leg of this loop. 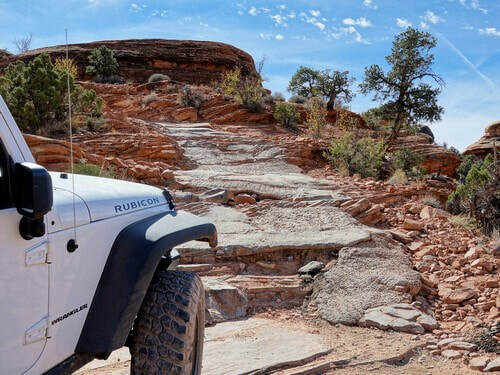 Head south toward Joint Trail and enjoy the needles that are the Namesake of the Needles District. There is an option to continue south and exit to Cottonwood Bridger Road. If you do not exit south, head back north over the Silver Stairs and go to the Confluence Overlook (Green and Colorado Rivers) then head back north and exit on the other leg of the one-way loop.